Be inspired by our newest video detailing the mission, purpose, and ongoing accomplishments of PEACE THROUGH BUSINESS®. As each new year begins, we tend to reflect on how quickly time seems to pass. In fact, time always keeps the same pace, but we busy humans tend to live in a way that challenges our attempts to be present in each moment. On this third day of 2019, IEEW invites you to take a moment to reflect on PEACE THROUGH BUSINESS® successes. Then, take one more moment to determine – from where you are right now – how you see yourself supporting women’s empowerment over the coming months. As advocates for women in business, PEACE THROUGH BUSINESS® contributors are doing much more than helping to create jobs, they are shaping societies around the globe. The PTB® model is not a Band-Aid approach – the word “Empowerment” implies quite the opposite. When a woman is empowered economically, she has the ability to not only improve her own livelihood, or even the livelihood of her community, but to actually contribute to national stability; advancing industry and creating an atmosphere of equality by diversifying the economic environment. 12 years of educating women entrepreneurs has created a system where those once trained by PTB® are now training others. The Pay it Forward component is the centerpiece of the program. A platform has been created whereby women can network, learn and grow from each other. PTB® alumnae – inspired by mentors, coaches and facilitators like you – step up to bring about change. 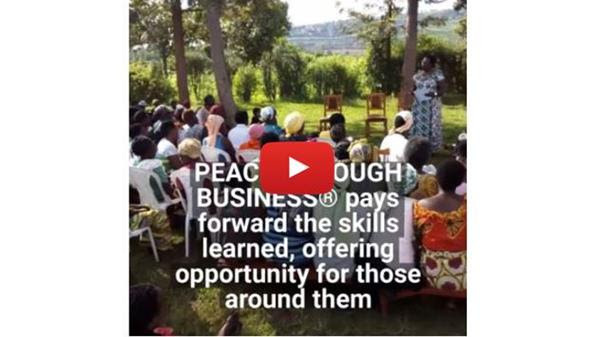 The Alumnae Association PEACE THROUGH BUSINESS® in Rwanda and the PEACE THROUGH BUSINESS® Network in Afghanistan, both spearheaded by alumnae, are creating opportunity and giving back to their communities. In Rwanda, alumnae are helping to generate bank loans for fellow graduates, inspiring young women and visiting women devastated by the genocide. Colleagues in Afghanistan are attending regional and international trade shows through the Women’s Chamber (AWCCI), supporting each other through their association, and helping their facilitator, Manizha Wafeq, by teaching and mentoring while taking the PTB® / Northwood University Pathways mini-course on the road throughout the provinces. The PTB® Class of 2019 has had a record number of applicants: 127 across both countries within industries ranging from agriculture and tailoring to medical clinics and web-based banking. 30-34 from each country will be selected to attend 10 weeks of in-country training, with a proven curriculum developed in partnership with Northwood University and experts like you. The training also includes guest speakers and an opportunity to be mentored by experienced entrepreneurs. From this group, 15 top students from each country will be invited to the USA for two weeks of Leadership Development. Current PEACE THROUGH BUSINESS® highlights are just the tip of the ice burg. There is so much more happening that we cannot articulate in a few choice words. Imagine…the owners of a men’s swimming club interested in studying with our women entrepreneurs! We truly are all on the same quest – the road to peace. We will continue to break down economic, social and political barriers thanks to supporters like you. Be a sustainable change maker. Step up and donate today with your time, talent and dollars. The Institute for Economic Empowerment of Women congratulates Habiba Sadeqi (class of 2014) and Razia Arefi (class of 2009). Both PEACE THROUGH BUSINESS® graduates were appointed as Deputy Municipal Chiefs for the 6th and 13th districts in Kabul, Afghanistan. It is an honor to have these women as part of the PEACE THROUGH BUSINESS® family. Kandahar was once one of the last bastions of the Taliban in Afghanistan. There were years during the early part of the war in which entire neighborhoods and streets were considered ‘no go zones’ due to the intense danger of the place. Kandahar is one of Afghanistan’s most conservative cities even today, but its airport and manufacturing industry make it a vital hub in the south of the country. Recently, a PEACE THROUGH BUSINESS® / Northwood University Pathways mini-course was held in Kandahar and attended by women entrepreneurs eager to learn new business skills to help grow their burgeoning businesses. 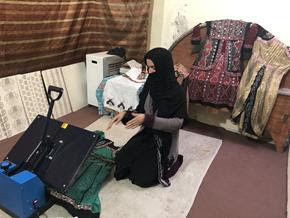 In Kandahar, you will still find many women covered from head to toe in black burqas, but at Nazia Tailoring, the colors tend to vary and have more style. Majority owner, Nazia Basharmal completed the five-day mini-course held in Kandahar and committed to completing her business plan to present to IEEW in March 2019. Nazia Tailoring began as a small cooperative two years ago. Today, they are a full-fledged company with twenty tailors alternating on day and night shifts to complete over 1,500 garments per month. Nazia’s goal is to convince more women to go to work, empowering them to shape their own future. In the pursuit of independence, Nazia has experienced humiliation and name calling on the streets. She feels that her ability to rise above the catcalls is now one of her greatest accomplishments. Women such as Nazia deserve a hand up. If you, or someone you know, would like to eMentor Nazia during this first quarter of 2019, contact mentorship coordinator, Karel Ford today: kford@ieew.org. “As a woman, I can’t find words to express my gratitude for this opportunitygiven to me and other women, by Institute for Economic Empowerment of Women (IEEW) and PEACE THROUGH BUSINESS® Rwanda which really changed my life and improved my business.” – Christine Hategekimana, PTB® Class of 2017. Christine continues to grow not only in her business but also in the arena of empowering women. 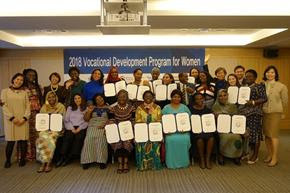 She recently won two awards while representing Rwanda at the 2018 Vocational Development Program for Women in Seoul, Korea (pictured above left). READ MORE about Christine’s growth as a leader and her dedication to Paying it Forward in her country. 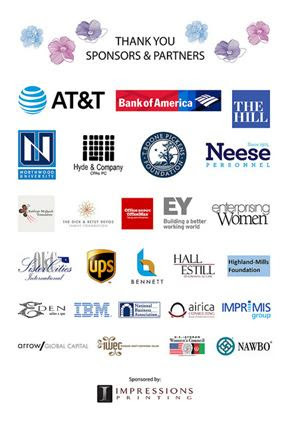 We would like to thank all of our sponsors for sustaining IEEW’s progress year after year. In 2018, we witnessed another successful Leadership Development program in the USA, where 20 Afghan and Rwandan graduates from the PEACE THROUGH BUSINESS® class were provided training and mentorship, and 2 alumnae from each country received additional training as leaders. In-Country Facilitator for Afghanistan, Manizha Wafeq, led another round of PTB® / NU Pathways mini-courses for business women in the Afghan provinces of Parwan, Kandahar, and Nangarhar. In case you missed any of our posts from the last year, you can find highlights, student stories and organization updates on the IEEW blog HERE. Thank you, sponsors, for a mighty 2018. Here’s to another year of empowering women! What a March! One for the Record Books.